“I adore Christmas romances. From Regency lords and ladies on romantic sleigh rides to crazy church Pageants in contemporary small towns, I can’t get enough of holiday love stories. After all, love is the meaning of Christmas. 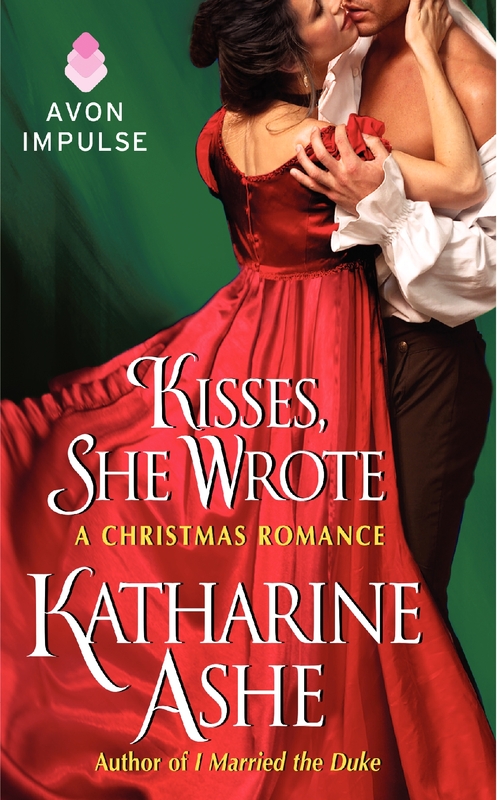 “My Christmas novella, Kisses, She Wrote, is finally here! (99¢ ebook & $3.99 paperback). But for weeks already I’ve been in the mood for delicious holiday reads to satisfy that cozy craving for romance. So I’m compiling a list of new and re-released Christmas romances,* including full-length novels, anthologies, novellas and short stories. I hope you’ll find stories here to enjoy curled up by the fire with a cup of hot cocoa or mulled wine, a plate of cookies beside you, and maybe even your best furry friend warming your toes. Click here to see the list, including stories by Shana Galen, Barbara Monajem, Jennifer Ashely, Robin Carr, Elizabeth Essex, and my critique partner Susana Ellis! Article by Maria Grace. She has one husband, two graduate degrees and two black belts, three sons, four undergraduate majors, five nieces, six cats, seven Regency-era fiction projects, notes for eight more writing projects, cooks for nine in order to accommodate the growing boys, and usually makes ten meals at a time so she only has to cook twice a month. Christmastide and the release of my new book are both coming soon upon us. To celebrate both, I am beginning a series on Regency Christmas traditions, possibly with a few of my family’s thrown in for good measure. Christmastide was a time for fun and frivolity. Parlor games made up a large part of the fun. They were played by all classes of society and often involved overstepping the strict bound of propriety. Losers often paid a forfeit, which could be an elaborate penalty or dare, but more often were a thinly disguised machination for getting a kiss. Often, forfeits were accumulated all evening, until he hostess would ‘cry the forfeits’ and they would all be redeemed. 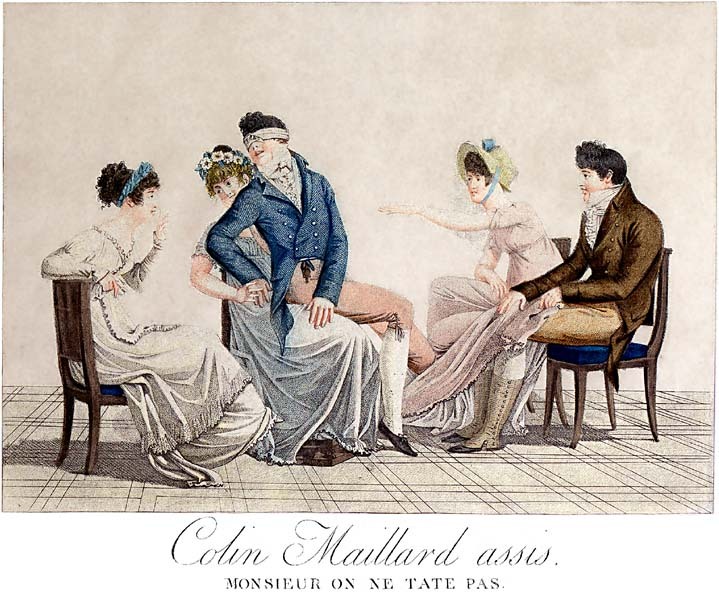 Here are a few of the games that might have been played during Christmas parties of the Regency. Many variations of this game existed, including Hot Cockles, Are you there Moriarty, and Buffy Gruffy. All the variations include one player being blindfolded and trying to guess the identity of another player who had tapped them or who they have caught. A great deal of cheating was generally involved, which only added to the sport. Click here to read the rest of the article at Maria’s blog, Random Bits of Fascination. What’s So Rotten About Rotten Row? It’s that well-known place people go to see and be seen. Today it might be an expensive restaurant, exclusive nightclub or even a famous seaside town. 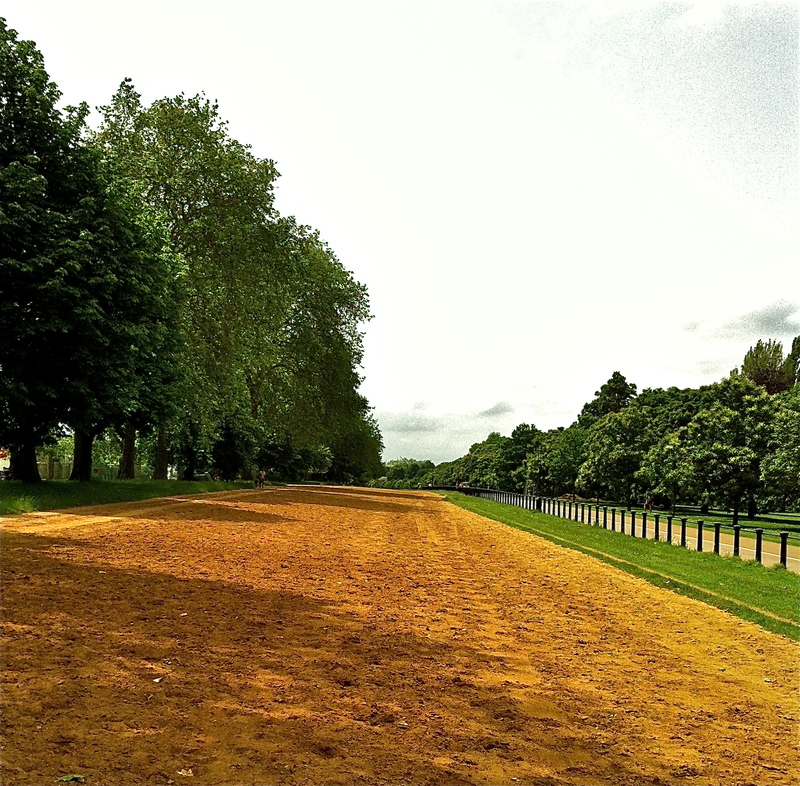 But during the Regency Era one place English aristocrats went to strut their stuff was a bridle path in London’s Hyde Park known as Rotten Row. This pathway was the ultimate place to people watch. On any given day the Prince Regent, Beau Brummell, or Georgiana, the Duchess of Devonshire might promenade down the bridle path for all of London to see. Quite simply, Rotten Row was the place to be. “In this distinguished Service, you will carry a Rifle no heavier than a Fowling-Piece. You will knock down your Enemy at Five Hundred Yards, instead of missing him at Fifty. On Service, your Post is always the Post of Honour, and your Quarters the best in the Army; for you have the first of everything; and at Home you are sure of Respect—because a BRITISH RIFLEMAN always makes himself Respectable. Who says you can’t learn things from fiction? I was first introduced to the 95th Rifles in Mary Jo Putney’s book The Bargain, where the hero was a wounded officer from that regiment. (Bernard Cornwell also uses them in his Richard Sharpe series.) I wouldn’t have thought anything else about it except that she included an author’s note and explained why she picked the 95th. I’m one of those strange souls who think history is a whole lot of fun, so I went right from the book to the computer and starting poking around the Napoleonic Wars and the 95th Rifle Regiment. It turns out they were quite different from the rest of their infantry brethren. The first thing I noticed was that the men and officers of the Rifles wore green uniforms rather than the familiar red—not a huge revelation if one is familiar with the British Army, but a small surprise for me. Their belts and trim were black instead of the white of the other regiments. Recruitment advertisements touted these darker uniforms as more comfortable and easier to care for. In practice, they drew the ridicule of other units (at least in the beginning—once the Rifle Brigade had proved its value, the taunting slowed considerably). Also, while most officers of the time were still purchasing their commissions and promotions, the majority of officers of the 95th were commissioned or promoted based on merit or seniority. “Soldiers of fortune” they called themselves, neither nobility nor gentry for the most part. Perhaps because of this, the Rifles were known as a more egalitarian outfit than their musket-bearing counterparts. The 95th Rifles went on to become wildly famous for their actions during the Peninsular War, being awarded regimental battle honors for Ciudad Rodrigo, Salamanca, Vittoria, The Pyrenees, Toulouse, and Waterloo, among others. Curiously, though, they were rarely awarded individual medals and recognition, though other soldiers in other units were regularly honored. I was reading the reviews on Amazon a couple of months ago for some Regency-era novel, and one reviewer was upset because the book was set in England (not the UK—she specifically mentioned England, so Scotland, Ireland, Wales, and the rest of the old Empire were apparently exempted). She went on to comment that so many historical romances were set in England these days that she was sick of them all, and wondered why authors never used more exotic locales. My first reaction was indignation—how dare she disparage a place and period so near and dear to my heart?! And it was a Regency novel she was reviewng, what did she expect? But the question rolled around in my head for a while, and I began to wonder the same thing, minus the resentment. Why is England so popular a setting for historical fiction authors? My attraction to English history is partly personal. I adore reading about many locations and periods of time, but many of my ancestors are English, including my grandfather. It’s interesting to me to study the history of a country so closely tied to my family. And since said grandfather died before I was born, it’s also a way for me to connect with him, to get to know him through the culture and events of his first home. I think, too, that Samantha Brown (from The Travel Channel) hit the nail on the head when she said that visiting England was, at least for Americans, Europe-light. It is exotic for us with the differences in food, accents, and dialects, but it’s not way outside our comfort zones. Traveling to London from the US seems kind of like visiting, say, Atlanta when you’re from Minneapolis—go with me on this one. Some accents are hard to manage, sure, but they still speak English and you can make yourself understood. Some of the food is decidedly different from what you’d find on your table at home, but it’s recognizable and you can find something you like. Your trip is full of new and exciting experiences, and you don’t have to worry about whether or not you can read the street signs. So what do you think? Are there other reasons readers might favor stories set in England? Or are there locations you prefer when you’re choosing a book? When I first started working on my novel, I was intelligent enough to ask a good friend of mine (who is an excellent writer in her own right and a British subject to boot) if she would please, please, please be my beta reader. I let her know that the story was set during the Regency era, and asked how much she knew about that period of time. She replied that she knew there was a Regency era in British history, but that was all. That, of course, is not a slight on her intelligence (because I secretly think she’s smarter than me), but it occurred to me that a lot of people might not know much about the period beyond the shirtless man on the cover of the historical romance they saw at the bookstore. It also occurred to me that an introduction to the period would make a good introduction to this blog, but there are a lot of great articles already out there. So rather than rehash what’s already been said, I’ve included links to some of the best articles I’ve found so far to get you started. The teacher in me is yelling “No, no! It’s not a credible source!” but Wikipedia has a good article on the British Regency, complete with a timeline, lists of important people, places, and publications. There are also some nice images for the visual learners among us—the Frost Fair picture reminds me of a pack of ice fishing shanties. Greenwood’s 1827 map of London has been a big asset to me, both as a read and a writer. Click on any part of it to zoom in, then click again to zoom in further. Here’s a beautiful website dedicated to the 95th Rifles, formed in 1803 as the first regiment to use rifles instead of the less accurate muskets. They saw a lot of action during the Peninsular/Napoleonic Wars. Regency Romance novelist Candice Hern has compiled a wonderful timeline running from 1788 through 1820 that gives more detail than the one listed in the Wikipedia article. Political events, literary milestones, musical accomplishments, theater history, and social developments of the extended Regency can be found here in chronological order, color coded by category. This is a nice article by Michelle Jean Hoppe that talks about the London Season. I like it because it’s not too long, but it’s well written and gives you enough detail to be worth reading. These are just a few of the websites I’ve frequented. What other good websites are out there for the Regency period? What are your favorites?